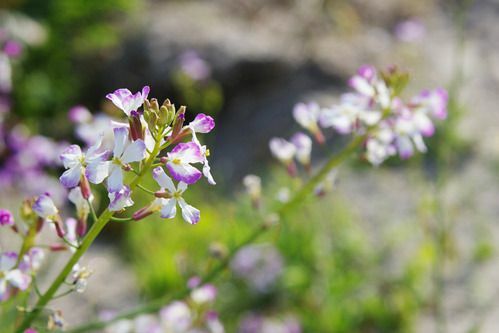 On the sandy valleys of the Hamasaka sun beach, from spring to the start of summer, the dainty hamadaikon (seashore radishes) begin to bloom on the sun-soaked coast. 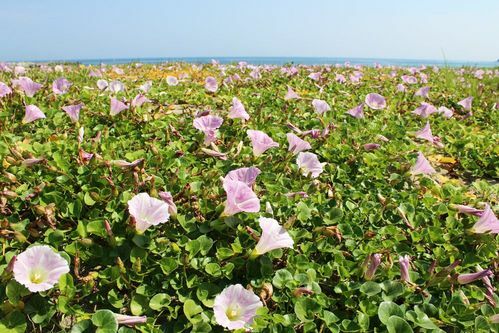 In June you can see hamahirugao (false bindweed/ sea bells). Hamahirugao is native to the sandy shore and grows just along the surface of the sand. Along the hundreds of meters of coastal road, you can enjoy countless 5 centimeter light purple flower buds in bloom at the beginning of July. Hamasaka also sells specialty dressing made with the hamadaikon of the region.